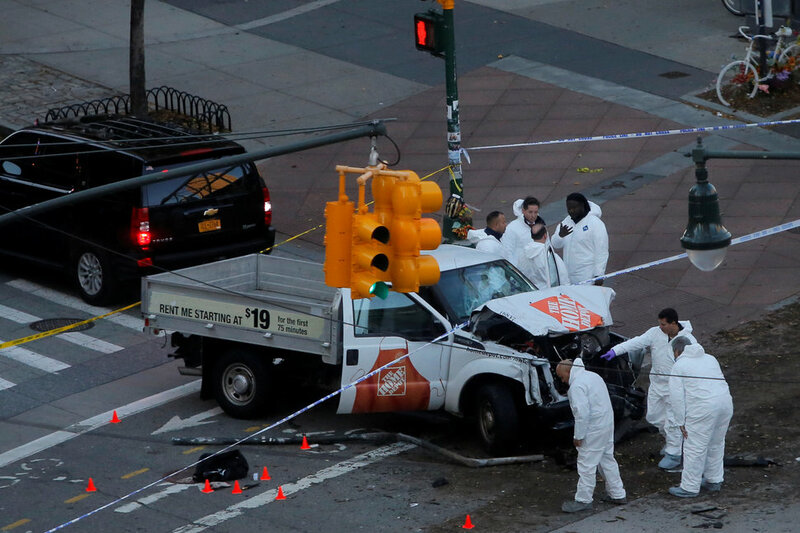 At least eight people were killed earlier today as a man in a Home Depot pickup truck purposely drove into a crowd in lower Manhattan. The rented van drove on a bike path on Houston Street near the World Trade Center at around 3:05 p.m. He drove southbound, killing and injuring pedestrians and bikers. The truck had also collided with a small bus and another vehicle, injuring two adults and two children. Nine people were also injured in the attack. The suspect was also holding two handguns, apparently a pellet gun and a paint gun. A cop shot the suspect in the abdomen, after which he transported to a nearby hospital. Parents waited anxiously for their children in nearby schools PS89 and Stuyvesant which were both evacuated. The suspect in custody is a 29-year-old man, Sayfullo Saipov from Tampa, Florida. No. I Won’t Blow You Up.